Your charitable donation helps us provide the very best care for our patients and their families, helps family caregivers care for their loved ones and themselves, and helps those who are grieving find comfort and healing. 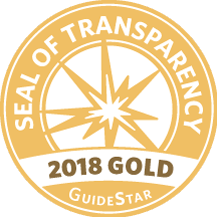 We are proud to have earned GuideStar’s Gold Star of Transparency, demonstrating our Foundation’s commitment to transparency, enabling donors to make better and more informed charitable giving decisions. 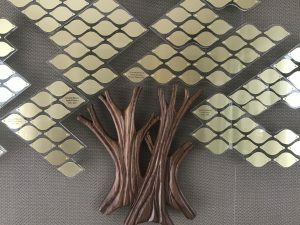 Memorial donations to Hospice Savannah are a meaningful way to honor a loved one while helping others in need. It our pleasure to notify the family of your thoughtful remembrance. Give securely online, mail your check to: Hospice Savannah Foundation, P.O. 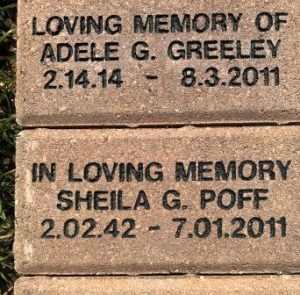 Box 13190, Savannah GA 31416, or call us at 912.629.1055 to make your gift over the telephone. .
A memorial brick in the walkway at Hospice House or the Demere Center for Living, a brass leaf on the Tree of Remembrance at Hospice House or the Demere Center for Living, or a memorial brick, bench engraving, or monument engraving on the Veterans’ Memorial at Hospice House creates a lasting legacy to your loved one. Call 912.629.1055 for more information. Our Thrift Shoppe is located at 331 US 80 in Pooler and features a variety of items including clothing, furniture and housewares. Community members have a place to donate and shoppers have a place to find great deals while benefiting Hospice Savannah. Double the power of your donation with a matching gift to Hospice Savannah! Many companies match charitable donations made by employees and retirees, helping your contribution to go even farther. Request your matching gift today! Hospice Savannah Foundation also welcomes gifts of appreciated stock or securities, gifts of real estate or personal property, and gifts-in-kind. A gift of a charitable trust or annuity, estate gift or outright bequest to Hospice Savannah Foundation is a meaningful way to leave a lasting legacy and make a difference in our community. Find out more on our Planned Giving reference sheet. Hospice Savannah is a member agency of the United Way of the Coastal Empire. You must write in “Hospice Savannah” to designate a gift through the United Way. Thank you. There are many ways you can help – host a fundraising event to benefit Hospice Savannah, become an event sponsor, and more. Please contact Ophelia Rodriguez at 912.629.1027 to learn more. View our most recent annual report to the community and learn more about how your gift helps. The official registration and financial information of Hospice Savannah Foundation, Inc. as registered with the Secretary of State of Georgia may be obtained from the Georgia Securities and Business Regulation Division of the Secretary of State by calling 404-656-3920. Registration does not imply endorsement.